- a light emitting Stanford bunny mesh illuminates the scene and casts soft shadows. 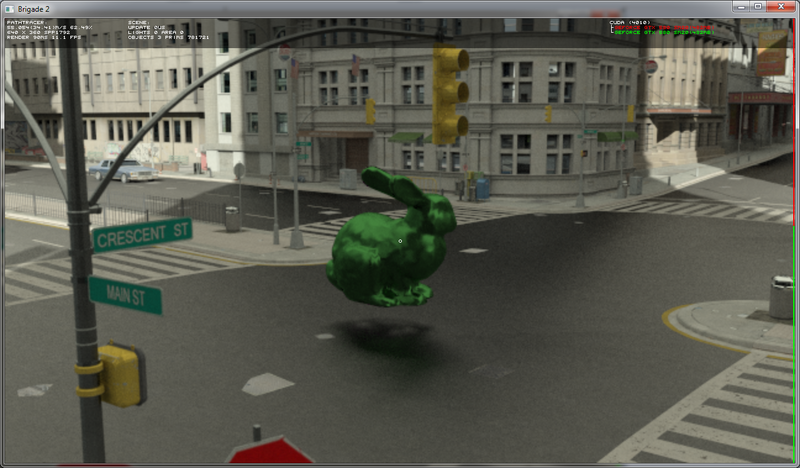 The bunny is fully dynamic. 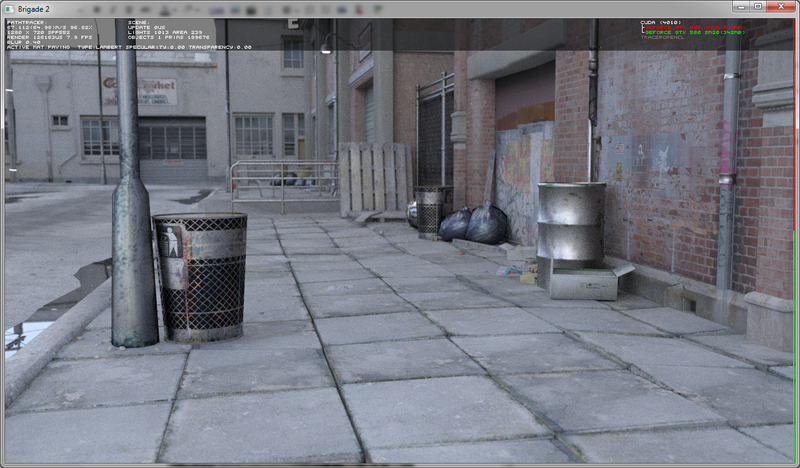 I really love playing around with this thing, the graphics are so utterly insane. 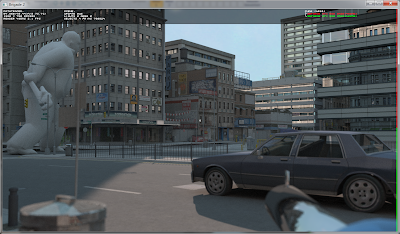 I'm not easily impressed, but every time I fire up Brigade, my jaw falls to the floor. You can't believe how many times I had to visit a maxillofacial surgeon for that. 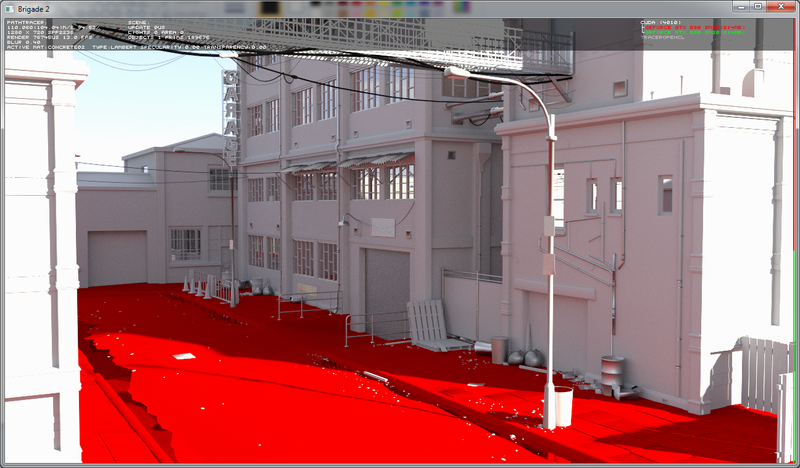 But it's worth it. This is quite a challenge for Brigade, because it's an enclosed environment with fairly complex geometry lit by multiple small mesh lights (no light from the sky or sun), a dreaded cause of Monte Carlo path tracing noise. 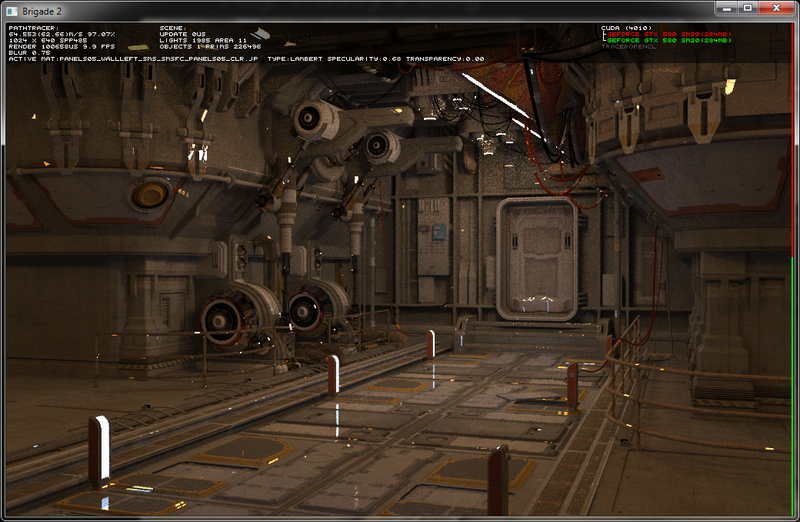 In brief, a perfect environment to test Brigade's convergence speed. 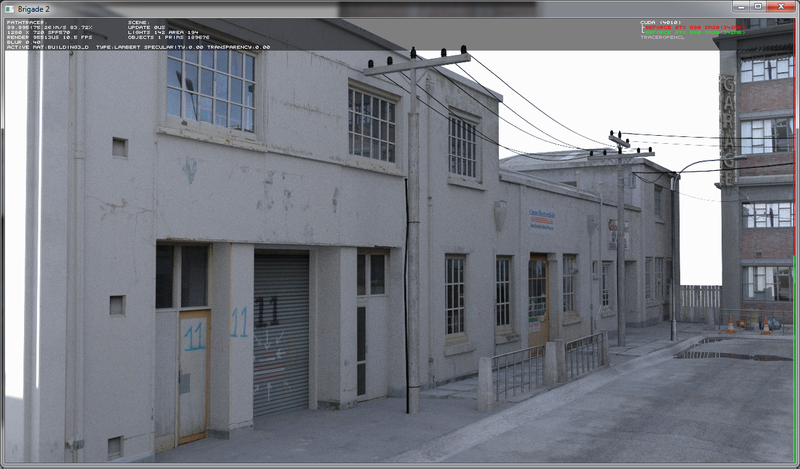 Much to my surprise, this scene converges extremely fast (as fast as an open outdoor scene lit by sun+sky), even with very small lights. 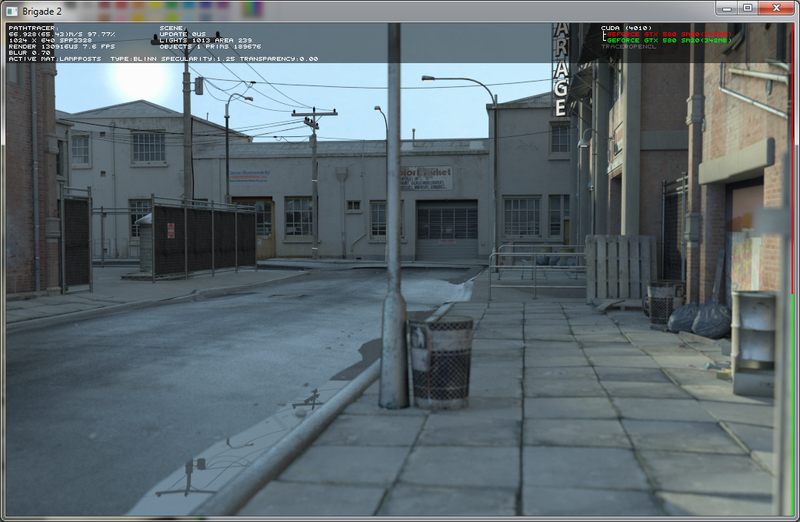 Brigade never ceases to amaze me. More screens and video soon. UPDATE: for comparison reasons, a screenshot of the original sci-fi scene (created by Stonemason/Stefan Morrell), which was rendered with finalRender can be seen here: http://stefan-morrell.cgsociety.org/gallery/536375. 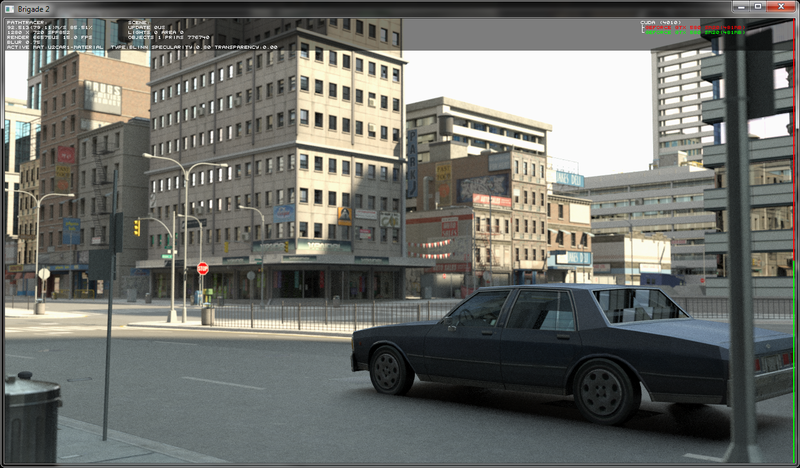 Brigade rivals the quality of finalRender, but more importantly, it does it in real-time. 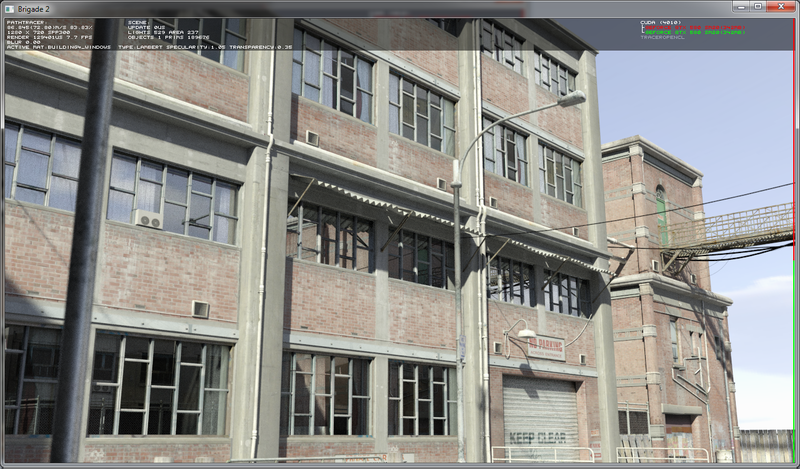 - ... the whole shebang. 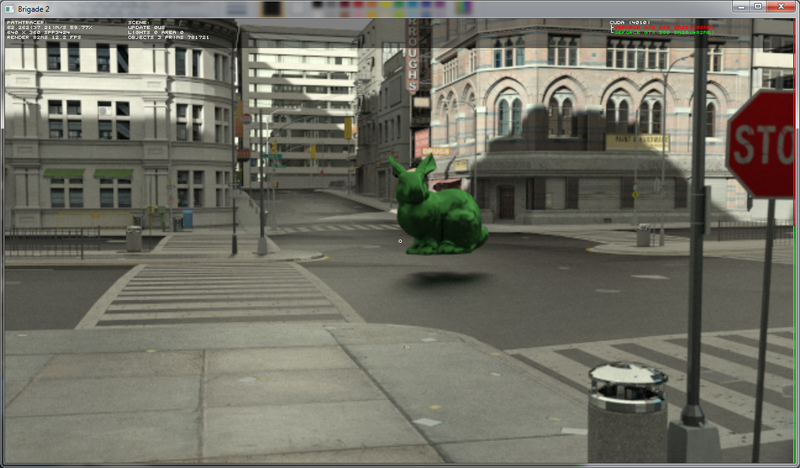 The coolest thing about Brigade is that all of these effects are virtually free and can be used aplenty. 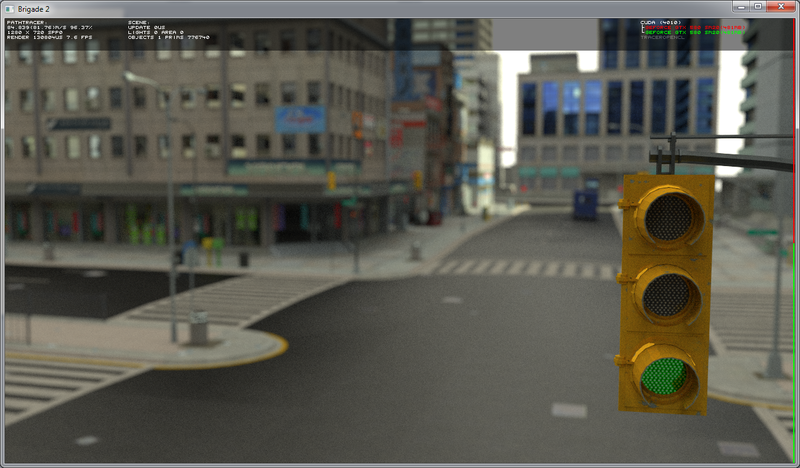 It's the magic of path tracing. 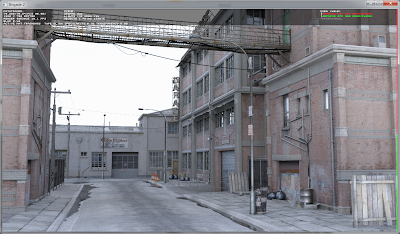 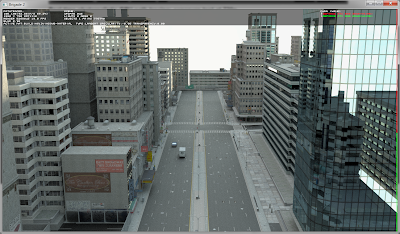 Real-time photorealistic GPU path tracing: Urban Sprawl 2 at double speed! As requested by a reader of this blog, I've tested the performance of the most recent Brigade code in the Urban Sprawl 2 scene with the same camera viewpoint as in the screenshot from the previous post. 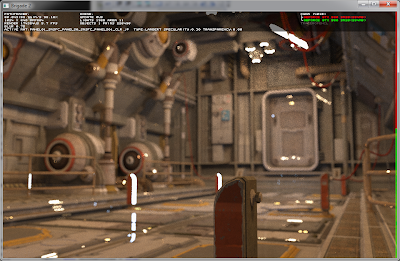 As of yesterday, Brigade is now twice as fast when converging (at no extra cost), thanks to moving a critical part of the rendering code to the GPU. 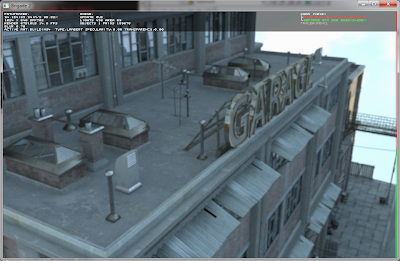 - a simple game: a Quake 3 style deathmatch FPS with an oldskool AI bot jumping over the roofs and some cars that will run over the player Frogger-style. The player will also be able to fire a grapple at a building's facade and swing in Spiderman fashion. Intricate storyline with unexpected plot twists TBD. 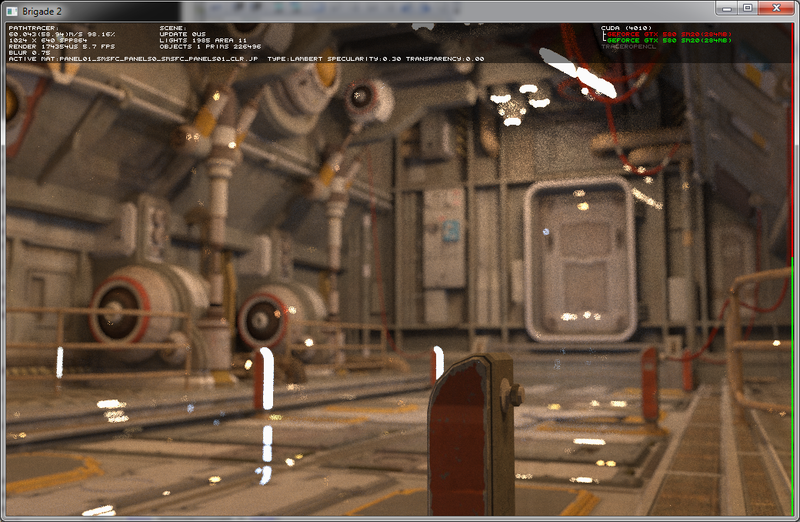 Arjan van Wijnen created a new real-time experimental OpenCL path tracer, called Laguna. It runs surprisingly fast and uses a seemingly new kind of grid-like acceleration structure (which the author calls a "precalculated blocks structure"). 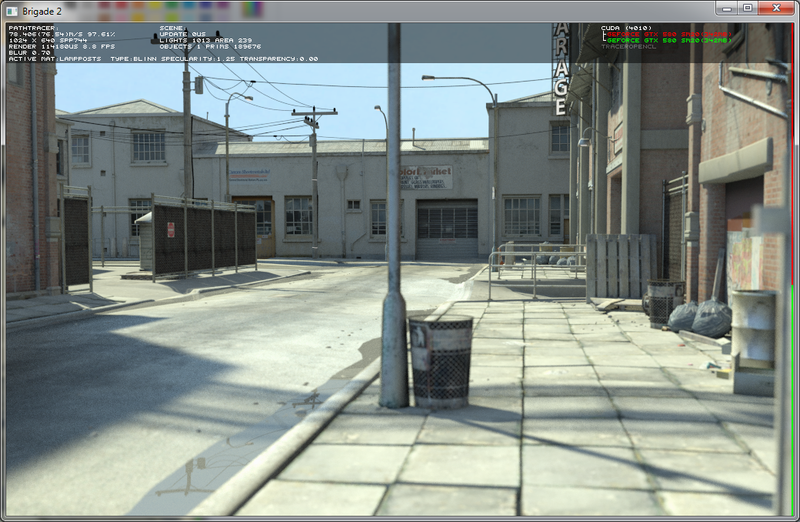 Something to keep an eye on. 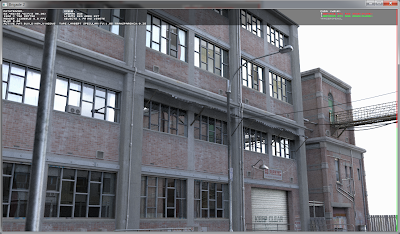 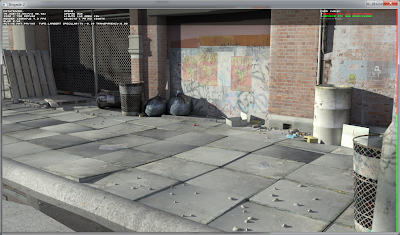 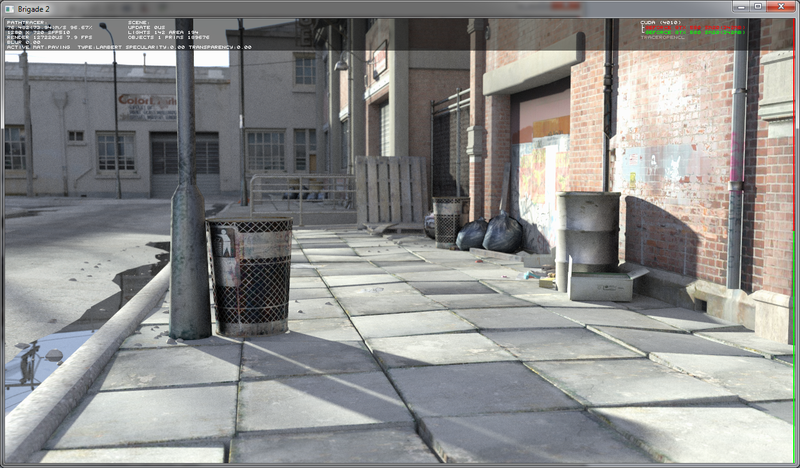 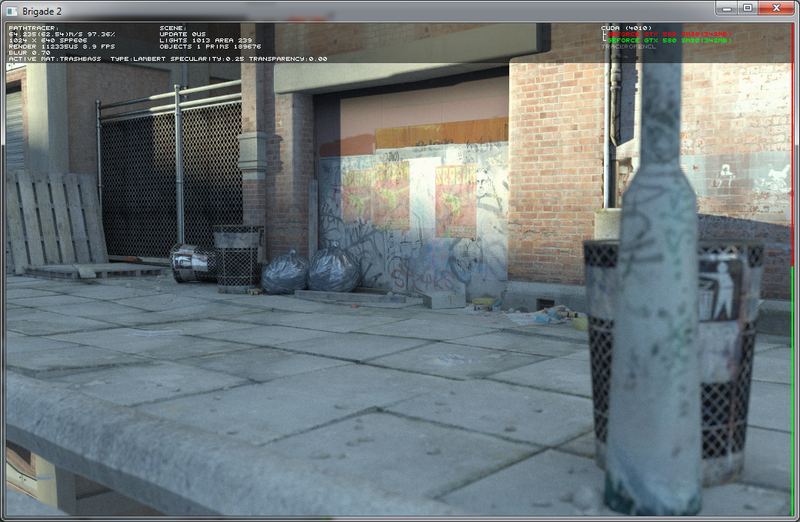 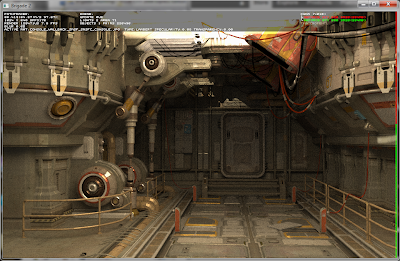 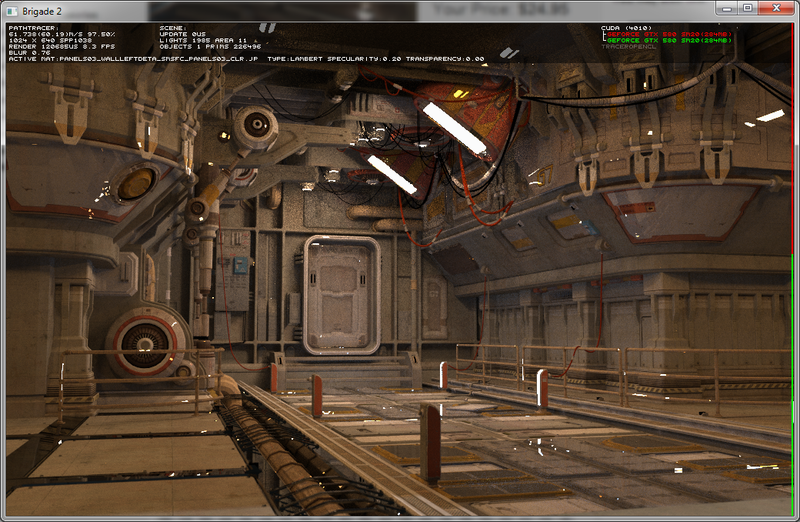 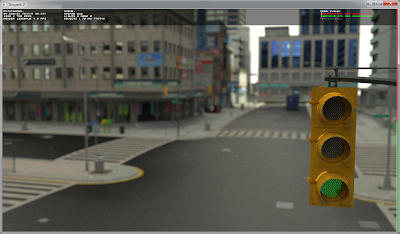 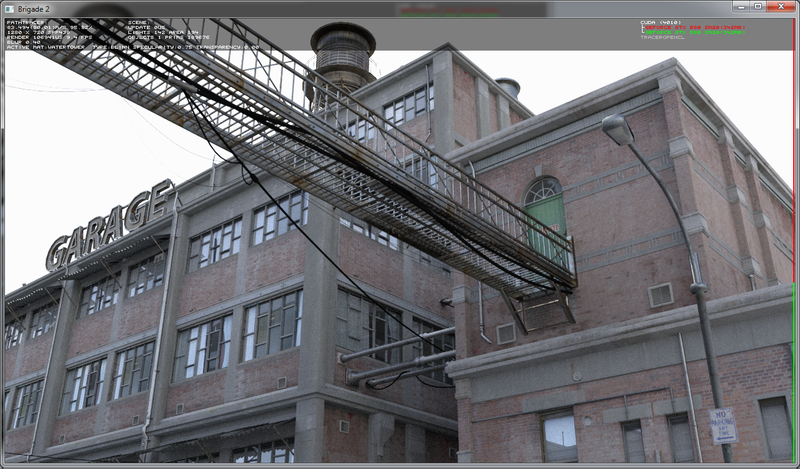 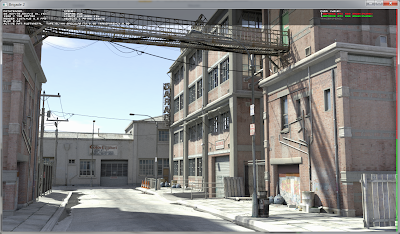 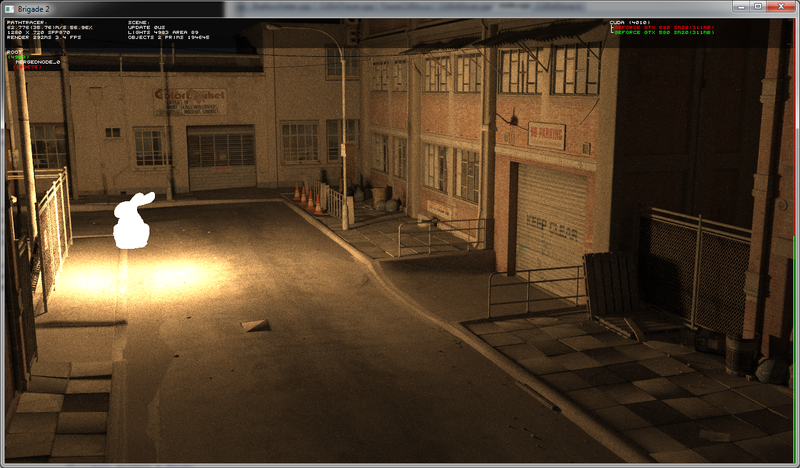 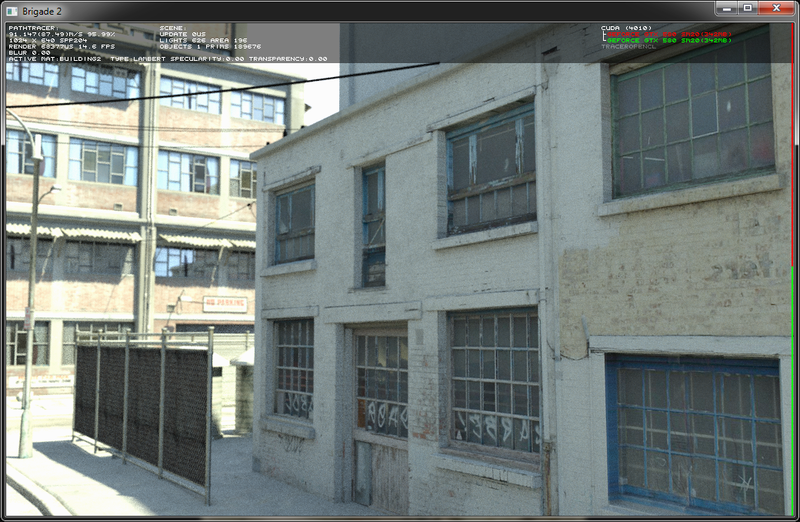 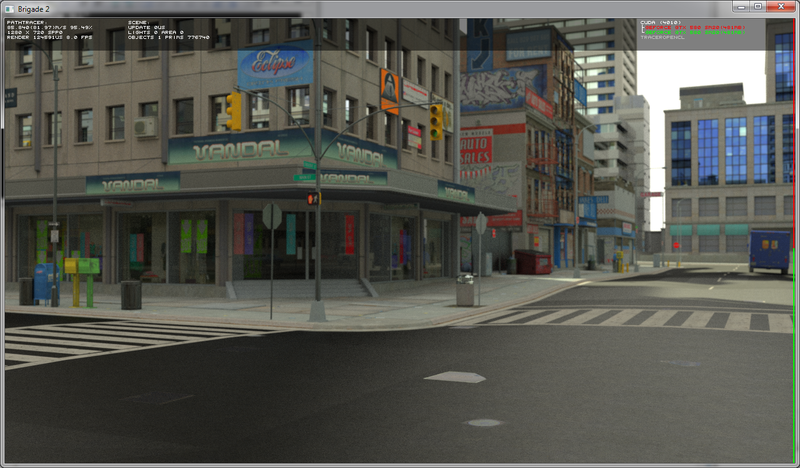 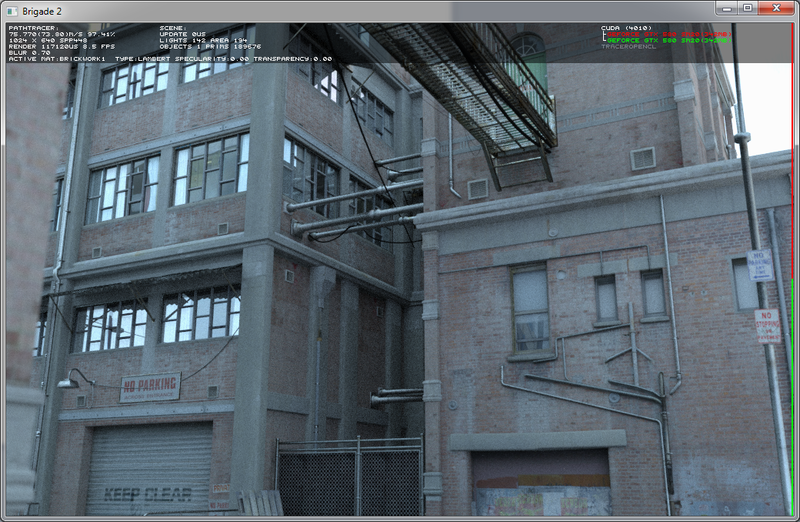 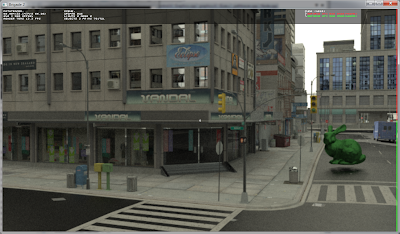 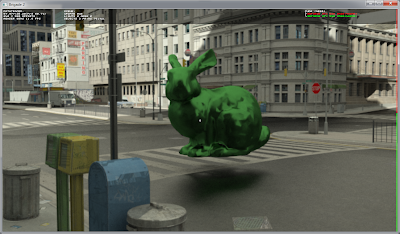 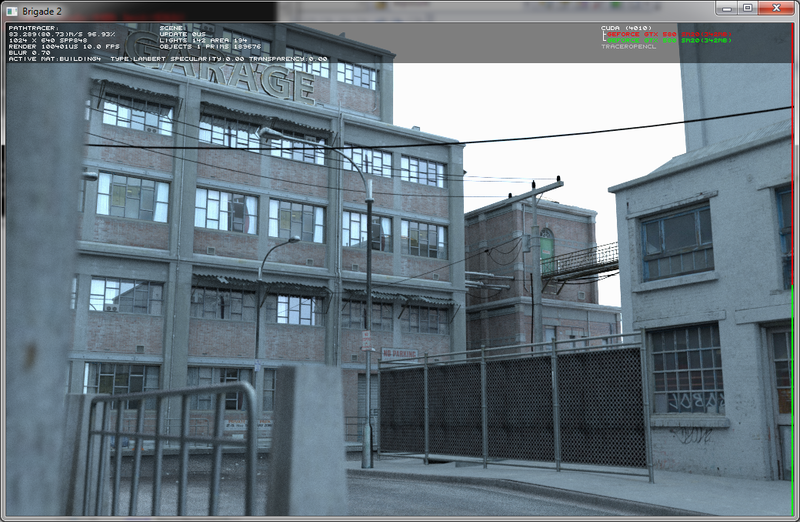 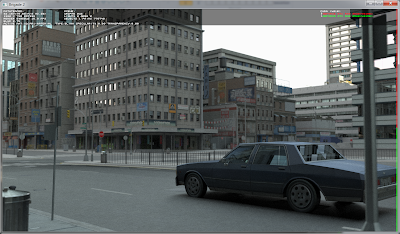 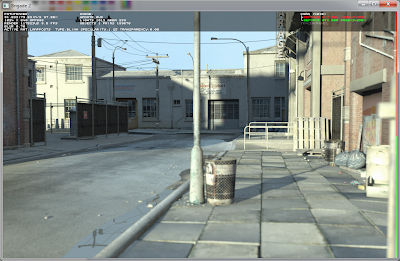 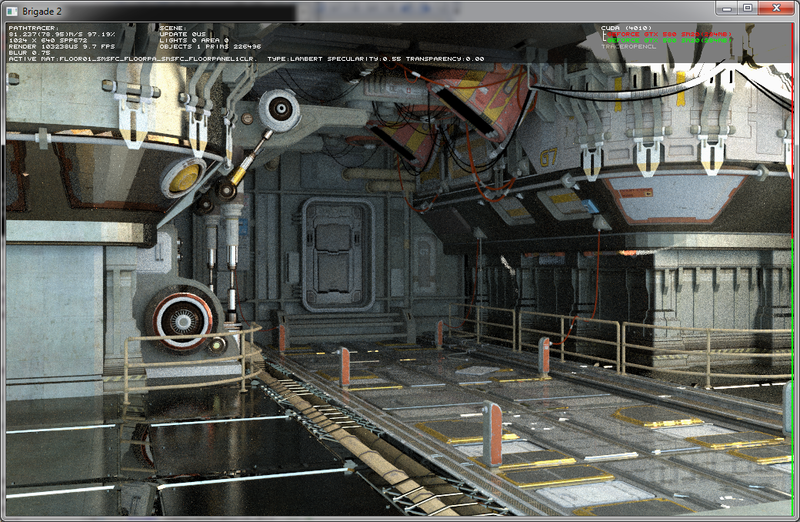 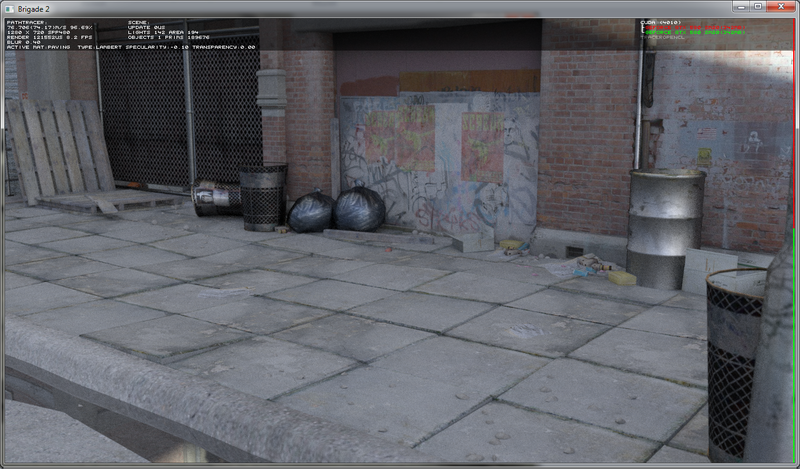 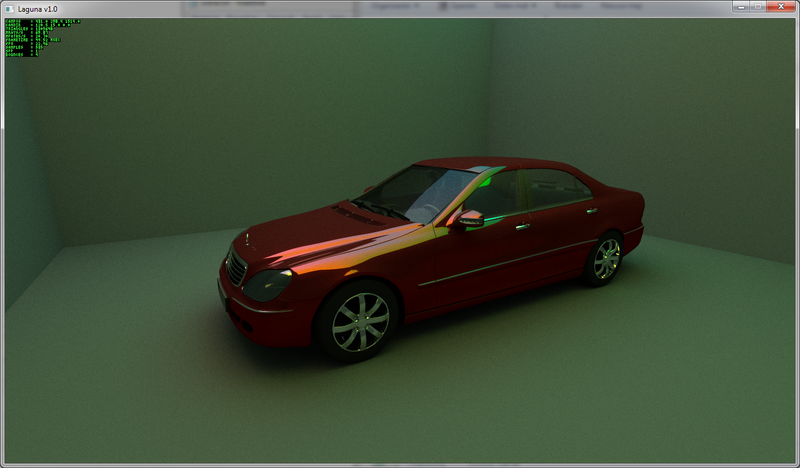 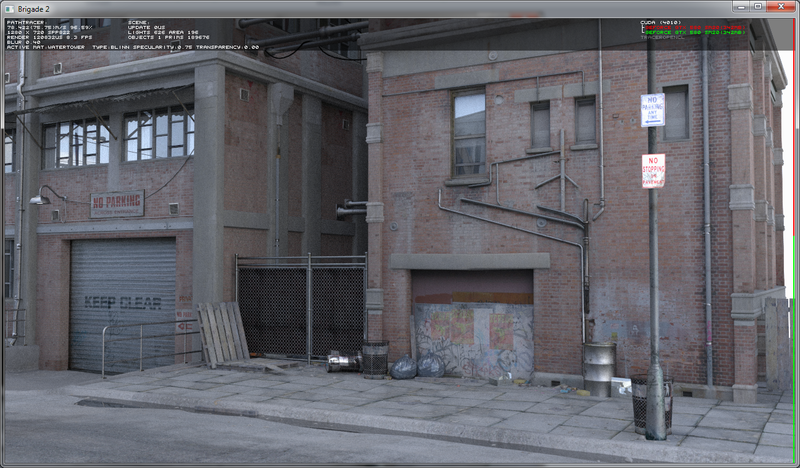 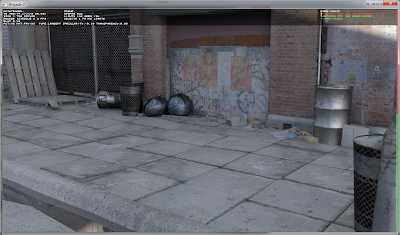 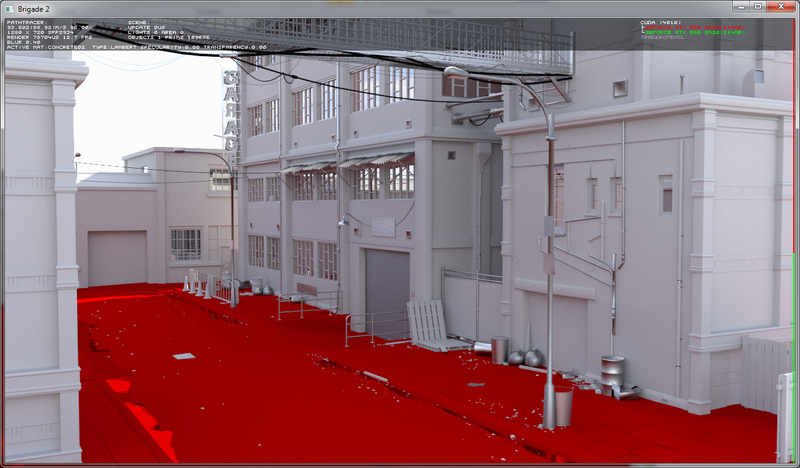 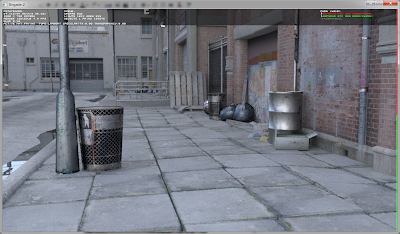 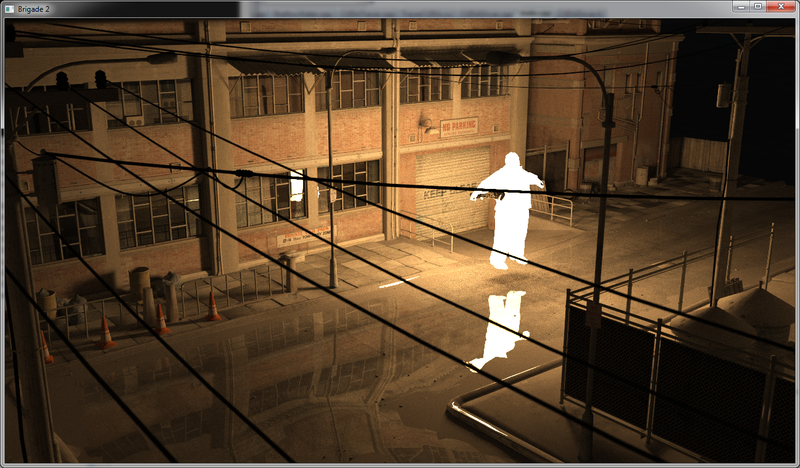 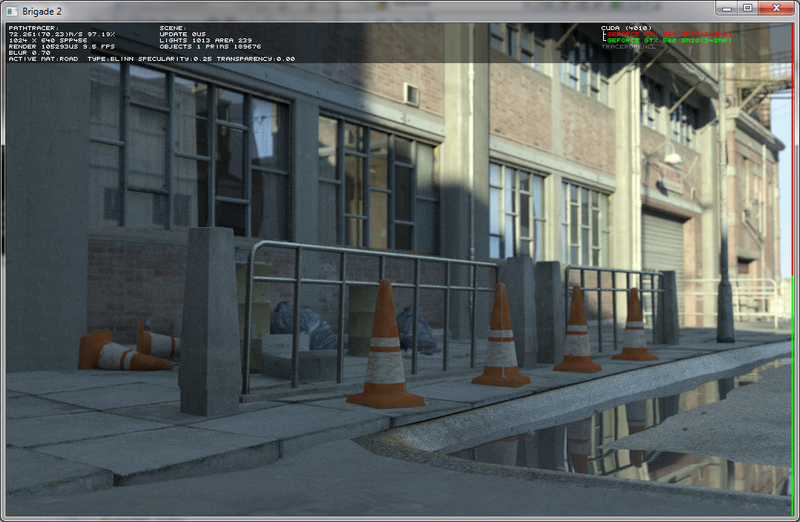 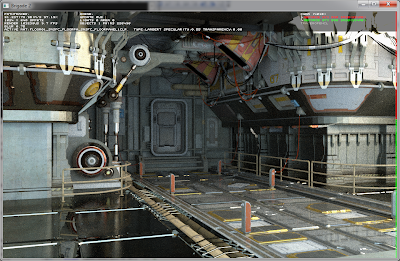 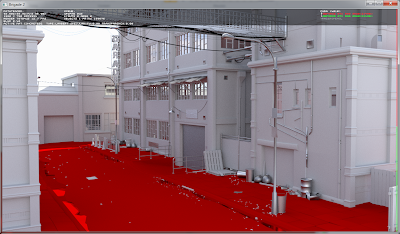 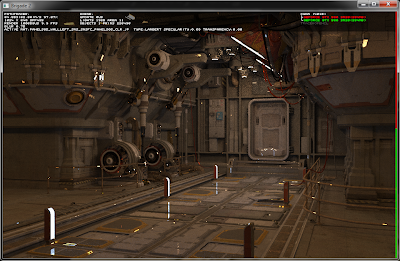 Screenshots and executable demo at http://www.geeks3d.com/20120502/laguna-real-time-opencl-path-tracer/. 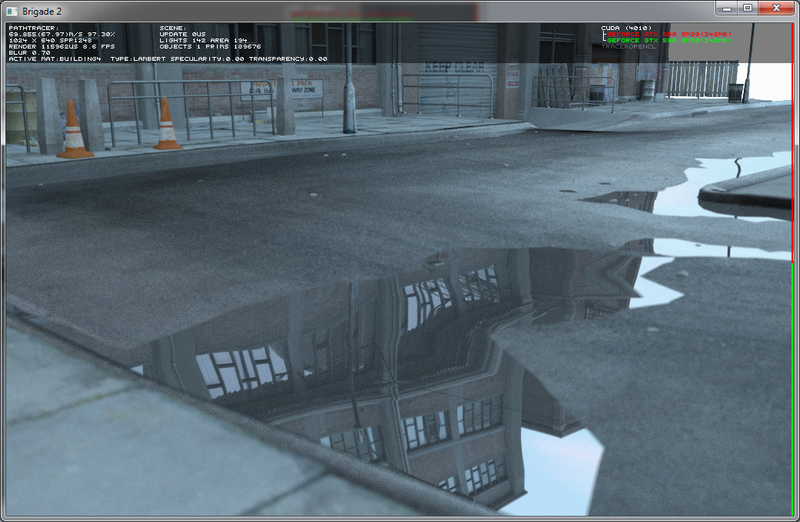 You can change parameters like resolution, samples per pixel, number of bounces and grid size in the 'scene.txt' file.